There are many tourism places that you can visit in Sulawesi Island. Some of them offer outdoor activities sport, or an extreme sport like rafting. But this destination is really extreme. Batu Dinding Kilo Tiga is a natural cliff that soars high around 90 m. “Batu Dinding Kilo Tiga” is known as the “paradise” for the extreme sport lovers. Besides having a unique shape, the difficulty level of the climbing route is included “hard”. 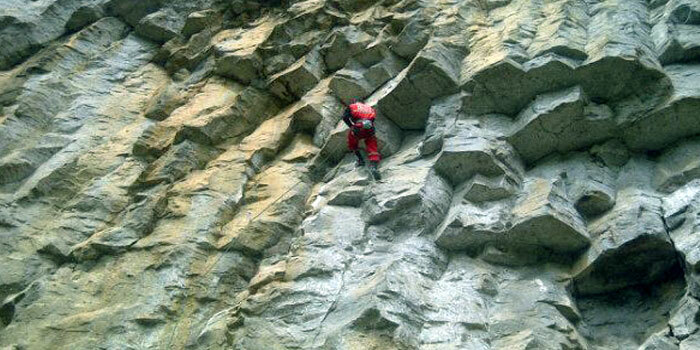 Some of national climbers admit that Batu Dinding Kilo Tiga is the toughest among cliffs in indonesia. “Batu Dinding Kilo Tiga” is a natural cliff which shaped so unique. 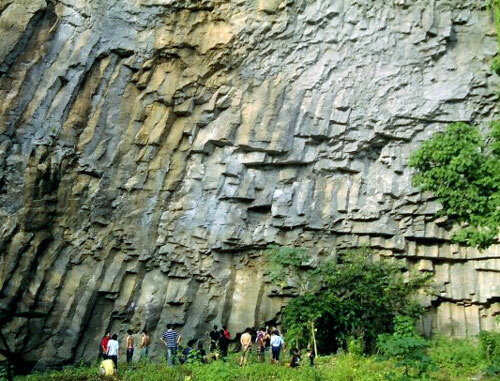 Unlike any other natural cliff, “Batu Dinding” (that’s what local people call it), has shape like lines of blocks but layered reversely. One upper block is on the block below it, so the higher it is, the more bulging the cliff’s surface will be. The gorgeous of “Batu Dinding” will arise if it seen from distance. But you will feel more awesome if you see it nearby, and see how those blocks can unite so perfectly. 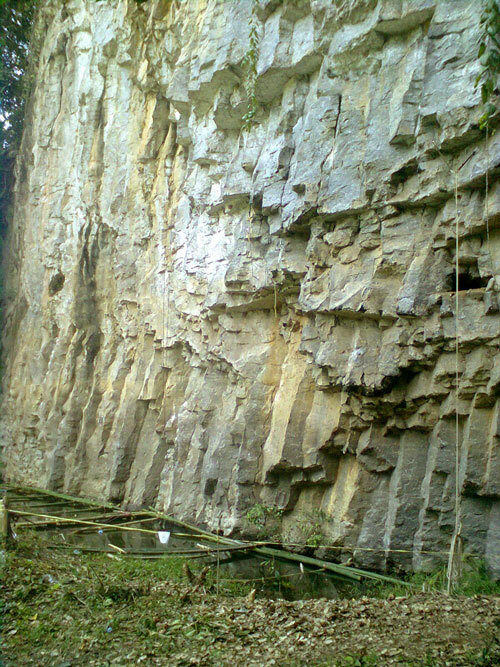 For you who like cliff climbing, “Batu Dinding” will give you sensation which will urge on your adrenaline. Your climbing experience will expand, and also will be tested here. The reversely blocks layers will make you spend more brain and power. Besides, there are routes that have been made in “Batu Dinding”. Some of them are also unique, because it has name and its own characteristic. Ofu route. “Ofu” is local language which means “bee”. It is named as “Ofu” route because the climbing route will pas some of bee hives. Of course, that hives still occupied. Spider route is a quite long route, where the route is many and discontinued. It is named spider route because to finish it, you have to jump from one line to another. Hang Dog route, is a route where you have to hang down several times. Clim or Swim route (COS), is a route which bordered with water flow in one side. This COS route is crossed and passing water flow which located below the cliff. So, when you fall in the middle of the climbing, you have to ‘swim’. Teri route (anchovies route), is a route named so because the members of the route maker only eat with anchovies. Tragedy route is a route as a reminder of a tragedy which happened when this route was being made. Some of the member team was dragged of “Ranoyapo” river flood that located in the nearby cliff location. “Malaria” route is also a reminder route because when the route is being made, all of the team members were struck by “malaria” disease. In the same time, it also attacked local villagers. “Malaria” route is included in the toughest route after lamentation route. Lamentation route is the toughest route climbing. It’s named lamentation route because when you climb this route, the skill of a climber will be really tested. Stamina, mind, and power will be much consumed to conqueror this climbing route. It’s a big probable that you will be complaining, or lamenting. Up till now, only few climbers that are able to pass “Malaria” And Lamentation Route, because those are the two toughest routes in and all Indonesia. But for you who don’t like cliff climbing extreme sport, don’t worry. Beside the magnificent “Batu Dinding”, the surrounding view of it is really shady and cool. Not far from “Batu Dinding”, you can see the clarity and the freshness of “Ranoyapo” river. This river is also often to use for rafting sport. The beautiful yet impressive cliff is located in “kilometer tiga” village, South Minahasa, North Sulawesi. “Batu Dinding Kilo Tiga” is 5 km southwest side of Amurang city, or 60 km south west of Manado city. “Batu Dinding” can be reached from Amurang / Manado city with personal car or public transportation. As information, using public transportation cannot be done only in 1x trip. You need to take motor taxi from public transportation dropping point to “Kilo Tiga” Village. After it, you need to walk a bit to reach the cliff. For you who want to visit “Batu Dinding”, won’t be charged for any ticket because it still in development plan. It’s suggested for you to give some donation, because the cleanliness and the maintenance of the cliff are done by local people. Accommodation facility and restaurants only available is nearest city to “Batu Dinding”, which is Amurang and Manado. Some of hotels near “Batu Dinding Kilo Tiga” that recommended are Minahasa Lagoon Hotel and Manguni Terrace Resort. If you interested in climbing “batu dinding”, it’s suggested for you to bring your own equipments. For safety and comfortability of climbing, it’s recommended that you contact “Cliff Hanger Amurang”, or nature lover communication forum (FKPA) of North Sulawesi.